New BusRide maintenance article on Thermal Balance Brakes | Thermal Technology Services Inc. 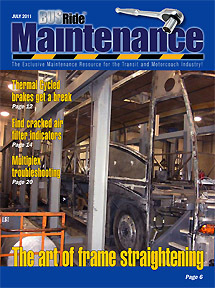 Thermal Balance Brakes was a feature company in the July 2011 edition of BusRide Maintenance Magazine. BUSRide Maintenance connects with the BUSRide readers who want to know how their peers diagnose the problem and get it fixed. Focused exclusively on the best vehicle maintenance processes and management practices, we invite all qualified and experienced maintenance professionals in the bus transportation industries — maintenance directors, technicians and mechanics, as well as OEMs, equipment and parts vendors and training institutions — to contribute editorial content. Check out the article by clicking the link below.